In spite of the publications in Israel, I am not the person who produced the list of 200 Israeli war criminals nor am i the one who launched the web site. I indeed linked to it because I thought that it could be a very important development on the road towards an ethical awakening. The link to the list doesn't work at the moment. But as far as I am aware, the relevant information is spreading around very fast. I will write about it in the coming days. 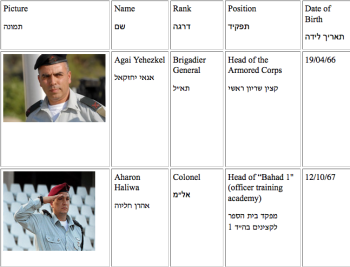 The names, the photos, the ranks, the positions and the addresses"